Why take on the practice of training your mind toward the positive? To offset your evolutionary biology. Because your brain is designed for survival, over time, as your ancestors were dodging tigers and other dangers, the default circuitry became more attuned to the negative. We developed neural networks that continually look for, react to, store, and recall bad news. Yet what protected our ancestors can hinder us today. Neuropsychologist Rick Hanson, in a class he led for our group of mindfulness teachers, explained that our brains are like Velcro for negative thoughts and Teflon on for positive ones—referred to as the negativity bias. If you find that you cannot let go of a negative comment someone directed your way, or you replay one piece of constructive feedback from your manager among five positive ones, this is why. On top of that, we not only tune to the negative—we amplify it. Our minds spin on perceived threats, losses, mistreatment, and our emotional reactions to them, then spiral into self-deprecating thoughts of aws, shortcomings, and mistakes, which kicks up feelings of self-doubt. This primes us to be more anxious, untrusting, and irritable with others. If you ruminate about whether something you did in the past was “right,” and then start beating yourself up, you are not alone. You are human. But there is something we can do. Our well-being depends on our ability to counteract this natural tendency to focus on the negative. Cultivating a mind tilted toward the positive takes sustained effort, yet our brains are wonderful, stunningly complex tools, and they can change and adapt—it’s that concept called neuroplasticity that I mentioned. You can use your mind to change your brain to change your mind—a principle Rick Hanson drilled into our band of teachers. Whatever you repeatedly say and do changes the structure and the function of your brain. Your neural circuitry can adapt and form new connections into adulthood, upending the previous belief that neural growth is static after childhood. The American psychologist William James said, “The greatest weapon against stress is our ability to choose one thought over another.” If you compensate for the brain’s bias by actively looking for and choosing the good, especially the little things that bring you joy, connection, and serenity, you will feel happier, more peaceful, more open and caring toward others, and more motivated for action. When we focus on something, specific neurons fire together, and the more often they do so, the stronger the neural connections become. “Neurons that fire together wire together,” Hanson teaches. What you practice grows stronger: Your ability to pay attention to the positive and incline your mind toward greater well-being is within reach. In the 2015 World Happiness Report, scientists Richard Davidson and Brianna Schuyler suggest four components of well-being supported by neuroscience: attention, outlook, resilience, and generosity. Each of these factors, they observe, are rooted in neural circuits that are subject to change—meaning that it’s possible to exercise these circuits to strengthen them. is is neuroplasticity at work. It’s a pretty profound idea that Davidson shared with us at a National Geographic talk in 2015: Well-being is a skill that we can develop with practice, preferably done in the morning to maximize effect throughout the day. So take the reins in how you start your day. After your sitting and breathing practice, choose one of the mental training exercises to incline your mind to the positive: It could be any variation of the loving-kindness practice, where you are sending good wishes to others, to an appreciation or gratitude practice like taking in the good, or you can recall recent moments where you witnessed acts of compassion or generosity, which also generates positive feelings and cultivates well-being. At a retreat I attended early in my mindfulness journey, Zen master and teacher Thich Nhat Hanh observed that we are intentionally “watering the good seeds” of positivity when we engage in this way, rather than watering the negative seeds—both of which are present. He shared the simple but life-changing wisdom that the conditions for happiness are always available to us if we open ourselves to them. It goes again to choosing which neural pathways you want to strengthen. Instead of wondering when a situation will change or wishing an anticipated event would soon arrive, you need only to condition your mind to look, pause, and savor the joy that’s already there. By delighting in micro-moments, you water the good seeds throughout the day—the feeling of tying your shoes before your morning run, the sun shining during an afternoon summer rain, or that surge of excitement and achievement when your team has a breakthrough idea. A friend in Miami snaps a photo every morning of the sunrise from his balcony, which is uniquely beautiful each day. My teaching partner in Sausalito captures the sunset on the West Coast. What are the moments of joy in your own life? The more you start to notice, the more frequently the positive feelings are activated. Due to repeated practice and what we know about neuroplasticity, you will find that you are more inclined to the joyful and positive, changing your brain, your moment-to-moment experiences, and potentially, your life. Settle your mind. First, arrive in the present moment. Be aware of your body, thoughts, and emotions as they are right now, wherever you are sitting, standing, or walking. Start with breathing. Practice a few minutes of mindful breathing, which will soon become your go-to reset step when pausing, relaxing the body, and directing your mind purposefully. Gladden the heart. This variation of the loving-kindness practice is a brief way to counter feelings of being alone and generate the warm feeling of belonging. Bring to mind someone you love. You might picture the face of a child, partner, friend, or even a pet. Smile as you visualize and feel the love owing back and forth between you and this person. Loving-kindness for today. Practice loving-kindness specifically for the day ahead. As you think about what’s on your schedule, bring to mind each individual or group of people you will encounter. Then offer good wishes to each person or group by repeating the phrase: May you be healthy, may you be safe, may you be well, may you be happy. Do this for five minutes as a minimum effective dose—although you can expand this depending on what is on your agenda. Take in the good. Try a “take in the good practice”—and apply it to the roles you hold in your life. Appreciate the contribution you are making in the world. Where are you serving? Bring to mind a central commitment—whether it’s raising a child, supporting a business venture, or working on an art project. Ask yourself: What is going well in this role? How am I contributing to it? To install that sense of appreciation and let it take hold, spend at least 15 seconds thinking about your contribution. See and savor joy. The practice of deliberately paying attention to the joyful moments in your life slowly starts to transform your day, and your life. Start in the morning, savoring the feel of a kiss on your cheek, noticing the wag of your dog’s tail, or marveling at the sunrise from your window. Make it a habit to savor joy throughout the day. 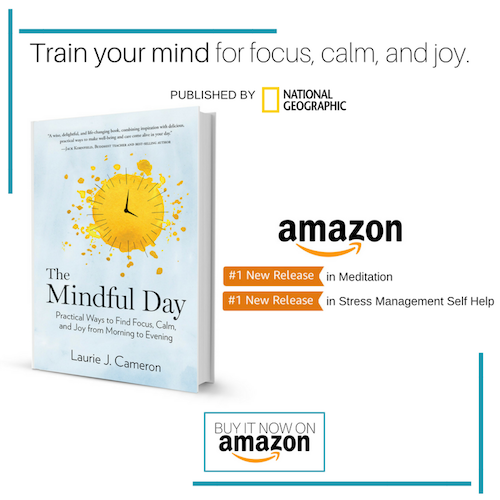 Original article by Laurie J. Cameron published by Thrive Global and original excerpt from The Mindful Day.